Peter was born in France and joined the Cistercian Order when he was 20 years old, along with his two brothers and his dad (his mom and sister also entered the religious life). Peter had a great gift for hospitality. When he was the abbot of Tamie in the Tarantaise Mountains, he built a hospice for travelers. He always helped the poor, and he started a custom of providing free bread and soup to farmers in spring, when their winter stores had been used up but their new plants were not yet producing. St. Peter of Tarantaise’s custom of distributing bread and soup to farmers during their “hungry” springtime lasted for more than 600 years, until the French Revolution. And even today in France, people make “May Bread” (pain de mai) all year round. It’s a delicious sandwich bread that toasts beautifully. Here is a recipe with step-by-step photos (this chef bakes it in a special pan, but a regular loaf pan works just as well). If you can, make an extra loaf and some soup and take it to somebody in your parish whom you know is having trouble making ends meet – a single mom (it is Mother's Day in the U.S. after all! ), a disabled person, or an elderly couple on a fixed income. 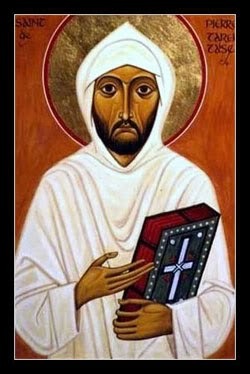 Saint Peter of Tarantaise, pray for us!